Textron AirLand Plans First Fly-In to Washington, DC; To Display in Conjunction with the Air Force Association’s Air & Space Conference and Technology Exposition. 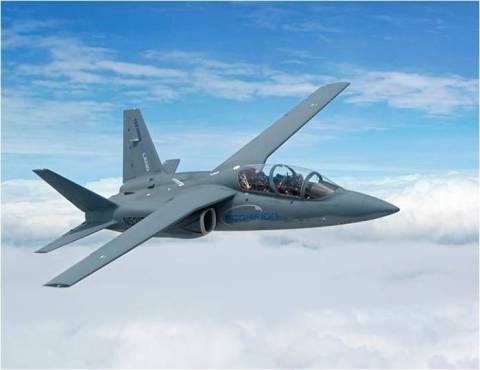 Textron AirLand, LLC, a joint venture between Textron Inc. (NYSE:TXT) and AirLand Enterprises, LLC, will bring its Scorpion ISR/Strike jet to Washington, DC for the duration of the Air Force Association’s Air & Space Conference from September 15 to 17. The aircraft will be displayed at Signature Flight Support Terminal, at Ronald Reagan Washington National Airport (DCA), approximately 10 miles from the conference center. The aircraft is viewable by invitation only, in a closed facility not accessible to the general public. Requests for media tours and interviews should be directed to David Sylvestre at dsylvestre@textron.com or (401) 640-6719. In addition to the aircraft exhibit, a Scorpion scale model will be displayed at the Textron AirLand booth during all hours of the Technology Exposition at the Gaylord National Resort & Convention Center on the Potomac, in National Harbor, MD. Scorpion has completed over 190 hours of flight time since the start of flight testing program on December 12, 2013. The objective of recent flights has been to gather data about the aircraft’s performance at various speeds, altitudes and climb rates, as well as to assess the Scorpion’s avionics, flight controls, environmental controls, hydraulics, braking and landing gear systems. Other testing has focused on the aircraft’s flying qualities across the full range of the Center of Gravity (CG) envelope, moving the CG from various forward and aft conditions. Recent flight tests successfully expanded flight envelope to FL430 (43,000 feet), and expanded the extension and operating envelope of the landing gear and flaps from 200 KCAS (knots calibrated air speed) to 250 KCAS. The Scorpion testing program remains on pace to complete 300-400 test hours this year, which will require about 150 flights. For a closer look at the Scorpion and its multi-mission capabilities, please visit www.ScorpionJet.com. Downloadable images and videos of recent test flights are available in the Scorpion Media Gallery. Textron is a multi-industry company that leverages its global network of aircraft, defense, industrial and finance businesses to provide customers with innovative solutions and services. Textron is known around the world for its powerful brands such as Bell Helicopter, Cessna, Beechcraft, Hawker, Jacobsen, Kautex, Lycoming, E-Z-GO, Greenlee and Textron Systems. More information is available at www.textron.com. Textron AirLand, LLC is a joint venture between Textron Inc. and AirLand Enterprises, LLC with the purpose of designing and manufacturing an affordable, capable jet platform based on commercially available technologies and processes for the tactical military jet aviation market. More information about our initial aircraft is available at www.ScorpionJet.com. AirLand Enterprises, LLC was formed by a group of experienced aerospace and defense executives dedicated to bringing an effective, low-cost, ISR/Strike jet to domestic and international military markets, replacing aging aircraft and complimenting high-end multi-role fighters.